Hi! A recipe for the best vegan mashed potatoes ever and some soy curls. Okay, so I’ve been meaning to make mashed potatoes out of cashew cream, and finally did. The results are amazing. I need to share it with you, alongside an air fryer soy curl recipe. Put these two with some green veggies and maybe some cornbread if you want, and you have a whole meal! Boil the cashews if necessary. Allow to cool. Boil the potatoes in a pot of water (just enough to cover them). I start a timer once the water boils for 15 minutes, and they’re almost always ready for me after that. If you’re not sure, test to make sure a fork can smoothly go into them before you stop boiling them. Blend the cashews, water, and salt in a blender while the potatoes are cooking. Set aside. You want the cream to be smooth, not chunky, so make sure you blend for long enough to achieve this. I do think it works better when you boil the cashews as opposed to soaking them. When the potatoes are cooked, drain the water. Place back in the pan. Mash together with the vegan margarine and cashew cream. Fold in the nutritional yeast, chives, and salt and pepper as desired. Enjoy the delicious creaminess. They taste even better when you reheat them the next day. Soak the soy curls for 15 minutes. Coat the soy curls in the oil, then sprinkle on the Bisquick mix. Stir around a bit until the soy curls are completely coated. Place in the air fryer for 12 minutes at 350 degrees F.
Enjoy along side the mashed potatoes with your favorite dipping sauces. Hope everyone is having a wonderful February so far! *Note: I decided to eat gluten this holiday…I need to go back to eating gluten free because I don’t feel great again, but I wanted to see how I felt with it. I’m glad I don’t have celiacs, but I’m definitely pretty sensitive. I’ve missed some of this food so much though. My brother illustrated a portrait of two of my cats for my dad’s business. It’s really cute. Cats seemed to be the theme of our Christmas this year. In fact, I made a bunch of cat sugar cookies. Unfortunately, I am a little weak with my decoration skills. For Christmas Eve we made my Pizza Strips and this caesar salad. My orange cat, Sammy, woke me up very early on Christmas morning so I went downstairs to make some cinnamon buns with coffee icing for everyone. Yum! They were a hit with everyone. I actually bought pre-made vegan cinnamon buns and just made the icing myself, because it would have been difficult to make them from scratch in the morning and have them ready on time. For my dinner I made Sporkfood’s frosted tempeh beet loaf. My mom made Chloe Coscarelli’s creamed spinach for me and twice baked potatoes. For dessert we made Chloe Coscarelli’s lava cakes with raspberry sauce, So Delicious coco whip and ice cream. And I got quite a few culinary presents in the form of new cookbooks! It was quite a delicious event! I hope those of you who celebrate Christmas all had a great holiday! Easy Baked Seitan Recipe for Vegan Homemade Hibachi! Hi all, it’s been awhile since I have posted anything. I’ve taken a sort of unofficial break to work on some other stuff. Things like my running blog, actually training for a half marathon, and my Banana Curl, Vegan Girl cookbook zine that’s all my favorite recipes from my childhood. I hope to complete it and start selling it by March. I’ve also started a new website, but haven’t done much work on it yet. It’s not ready to share yet, but I plan to have it be an informational website for vegans of all levels interested in various topics around veganism for social justice and support for people who want to become new vegans. I’m really excited about it, but I have to be patient and keep it secret for now while I’m working on it. In the next few months or so I will be trying to post new recipes more often as I’ve gotten a bit out of habit with it. I will be sharing recipes I’ve created for the zine too to get you all excited about buying it when it comes out…(It’ll be cheap, like 2-5 dollars I think). One of those recipes I’d like to share is my recipe for Vegan Hibachi. I loved hibachi and other Japanese foods so much growing up as a kid. We had this restaurant in Providence called Fuji when I was very young in Providence that we would always go to. We went there so often that we got to know the family who owned it really well. Their daughter even came with us on a trip to San Francisco. Unfortunately, it went out of business years ago, but I still have fond memories of it. They always gave us Botan Rice candies as a treat when we left, which I still love (and they are vegan too!) It wasn’t a hibachi restaurant. It was more traditional. After it went out of business we often went to Hibachi restaurants. I feel like trying to recreate a dish from Fuji I would never get right, and would not do justice to. So, I have settled on making yummy vegan hibachi. This recipe consists of 4 major steps, but with some planning I am sure you can pull it off! 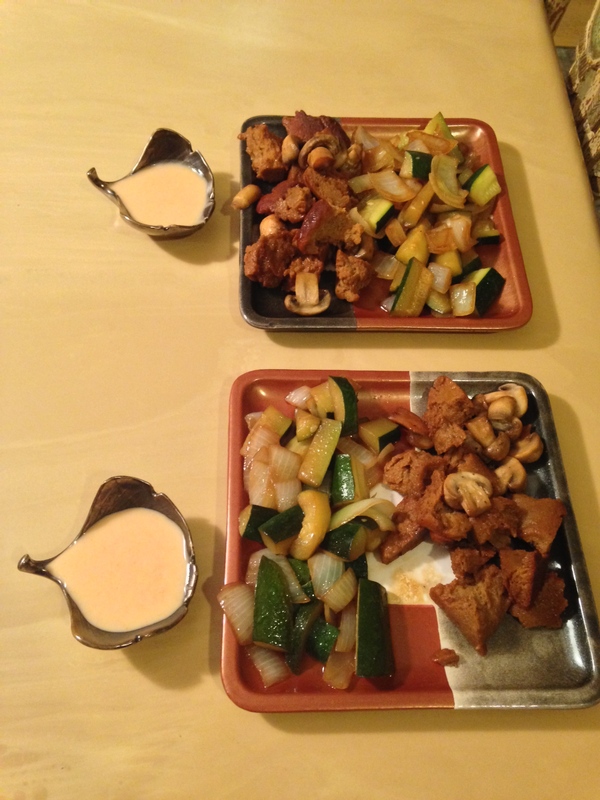 Make the Yum Yum dipping sauce and baked seitan the day before, then prepare the veggies and seitan and mushroom hibachi right before serving. Let sit in the refrigerator for at least 4 hours, preferably overnight. Use as a dip for the hibachi. Mix dry ingredients in a bowl. If you have an electric stand mixer, place them in the bowl for that. Add the wet ingredients into another bowl or large measuring cup. Stir together well. Stir until there is no loose powder. When cohesively stirred together, use the dough hook attachment on your mixer, or knead the dough by hand on a clean surface for 10 minutes. Place into a loaf pan, stretching it to fit the length of the pan. Heat for 30 minutes, flip over, reduce heat of oven to 350 degrees, and heat for another 20 minutes. Allow to cool for 5 minutes, then take out of the loaf pan and place on a plate to cool. Slice up into pieces as desired. Place a tablespoon of oil in two separate skillets. Heat oil over medium heat. Melt Earth Balance in the skillet in which you will cook the veggies in. In the other, add 2 tablespoons soy sauce and the mushrooms. Cook mushrooms until their juices are released. Melt the Earth Balance with the mushrooms and 2 more tablespoons soy sauce. Add seitan to the mushrooms, cook until heated, stirring frequently. In the other pan, place the veggies into the oil and melted Earth Balance, add 4 tablespoons soy sauce, and sprinkle with a pinch of salt and pepper. Stir frequently, until everything is fully cooked. Serve with Yum Yum sauce to dip in. 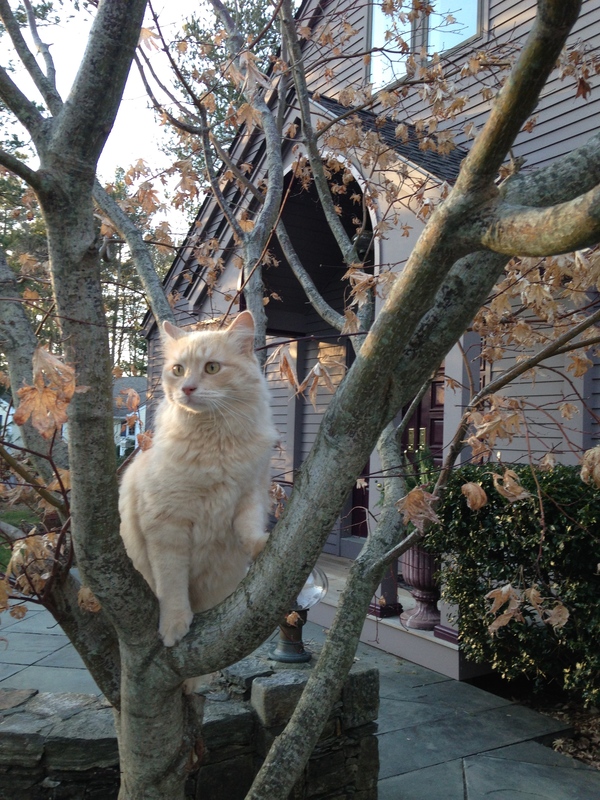 Ps: here is a beautiful picture of my cat, Franz, that I took recently and wanted to share. Isn’t he cute?